One of the most effective ways to get rid of bed bugs is with a heat treatment. Bed bugs are highly susceptible to direct heat: temperatures over 130 degrees will kill bed bugs and their eggs in a matter of minutes, and cranking the heat up to over 180 degrees will kill them on contact. Many of your belongings can be treated in a laundry machine or a portable heater, like a Packtite. However, you’ll want a way to apply direct heat to your walls, floorboards, furniture, and other areas that obviously can’t be thrown in the wash with your socks. That’s where a quality bed bug steamer comes in, with all of the right features and accessories needed to perform a home bed bug extermination properly. A quick Google search will tell you that the market is jam-packed with different steam cleaning solutions, all at different price ranges. How can you know which bed bug steamer is the best pick for your needs and budget? Arguably the most important function of a bed bug steamer is its ability to produce hot steam. Otherwise, we’d just write about throwing pots of hot water on the pests (and we aren’t suggesting that). Whatever steamer you buy should be capable of producing at least 200-degree steam at the tip, to ensure that bed bugs and their eggs are killed on contact. Just about every steamer manufacturer will list the PSI that their models are capable of, so this is the perfect place to start your search. Higher boiler temperatures result in higher steam pressures, and higher steam pressures result in hotter dryer steam. The bare minimum you should consider is a PSI of at least 40, and a boiler temperature of at least 220 degrees. These specs will ensure that the tip temperature will be hot enough to do the job. For best results, consider a steamer that can put out around 60 PSI. 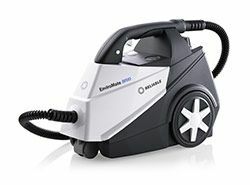 Enviromate, Vapamore, and Ladybug all offer bed bug steamers with this higher pressure range, producing dry steam for a simpler and more effective heat treatment. Odds are pretty good that you don’t enjoy taking time out of your life treating your home for pests. If you want this job done as quickly as possible, you probably don’t want a steamer that will need refilling every 10 minutes. This is why the capacity of a bed bug steamer is so important – the larger the tank capacity, the longer it can be used between refills. Small handheld steamers typically have a water capacity of about one cup, giving you up to 15 minutes of steaming action before it’s time to unplug and refill. Since you need to be thorough when treating for bed bugs, you may have over an hour of steaming to do to cover all of the potential hiding places in your home. With that in mind, you should consider a larger bed bug steamer with a more generous water allowance. The Vapamore Primo and EnviroMate E3 may be a bit larger and more expensive than a handheld supermarket steamer, but with over 7 cups of water in the tank, you can steam for at least an hour before refilling. If you’re a serious steam cleaner, or are looking for a professional solution, you might consider a steamer with continuous flow. This means that the water tank continuously fills the boiler, so you don’t have to wait for the water to heat up after you fill the tank. Just keep topping it off as you steam, and the feeding mechanism does the rest. This feature is available in premium models from brands like Ladybug, Desiderio, Vapamore, and EnviroMate. For more precise control over your steam output, consider a model with an adjustment knob. This will allow you to increase or decrease the output pressure of the steam. If your bed bug steamer has an adjustment knob, you can lower the pressure for direct applications to avoid blowing the bed bugs all over the place. You can also increase the pressure for deeper penetration in cracks and crevices. If you want a steamer that can clean floors as well as kill bed bugs, look for one with the appropriate attachments for your floor types. Not all steamers come with attachments for surfaces like tile, hardwood, and carpet. Some commercial bed bug steamers have wet/dry vacuum functionality in addition to their steaming ability. This is especially handy for cleaning purposes, as you can vacuum while you steam and reduce the amount of equipment you need to haul around. Most steamers need at least 15 minutes to boil the water before you can begin your treatment. To reduce this time, look for a steamer with higher wattage, multiple heating elements, and/or direct injection.